Description: Fresh paint is seen here on a pair of B32-8WH as they lead the Sunset Limited past the pastor Jimmy Swaggard made famous London Lodge motel in the background. Description: A GE P32-8 in a lash up in Los Angeles Union Station on October 7, 1995. Description: My favorite Amtrak paint scheme! Description: Amtrak 508 takes a cut of Superliners to the washer. 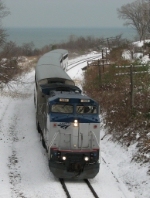 Title: Superliners and a Dash-8; Why can't we have this all year on the Pere Marquette? Description: train 370 takes the siding.